Lorton lies at the northern end of Lorton Vale, a beautiful valley which runs from Cockermouth in the north-west to Buttermere in the south-east. The river Cocker runs the full length of the valley, and at the end of the 18th century its fast flowing tributaries that flow down from thefells, through the village were used as the motive power for flour and linen mills. Some of these mill buildings survive today. Either side of Boon Beck bridge are buildings which used to be a linen mill but were later used by the Jennings family as their brewery. The 'Yew Tree Hall', now the village hall, was once the brewery malt house. Jennings moved to Cockermouth at the end of the 19th century and their ales are still brewed there. Naturally farming has been a significant part of village life, indeed, many of the cottages there today started life as barns. Three other parts of the village are worthy of mention here. The church, built in the early 19th century has some attractive monuments, and the headstones show many local families. One of these is to Richard Harbord who died in 1878, the original owner of Lorton Park, an attractive feature of High Lorton. On the other side of the road which runs by the church and which was the boundary between High and Low Lorton is Lorton Hall which is built around a 15th century pele tower. The boundary has little significance today, with both High and Low Lorton being referred to as Lorton. John Wesley preached three times in Lorton, in 1752, 1759 and 1761. Just along the road from the cottages is a chapel, built in his memory in 1840, and up until recently was still used for services, albeit only once a year. Close to the boundary wall of Lorton Park stands a small round 'castle' with battlements at the top. It would be lovely to imagine children from the estate using this as a play castle, but in fact it was a smoke house for smoking fish and hams. The village school, next to the tennis courts (visiting players welcome) was built in 1895 and has a number of commemorative plaques, including one from the Diamond Jubilee of Queen Victoria in 1897. The village pub, The Wheatsheaf, serves lunchtime and evening meals, and naturally the local Jennings ales. It has a small but attractive garden with bench seating for those long hot summer days. Lorton has its own small, village shop where most necessities can be purchased, please visit their website for further information. Larger shops are found in nearby Cockermouth and Keswick, both of which have a post office. 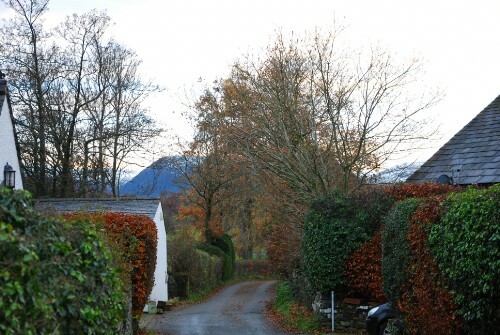 Lorton is an attractive village which will repay a casual stroll along its little used lanes - it is easy to select a round route from the map. There are principally two footpath routes, one runs from just past the Lorton Park smokehouse, across the fields to the lane by the church. From here it goes through the churchyard and across to the B5289 Cockermouth to Buttermere road, emerging just beside the pub. The other path runs from High Mill bridge. alongside Whit Beck to High Whitbeck Bridge and on across more fields to Whitbeck Bridge on the B5289. The village shop is about 400 metres from the cottages. There is a daily bus service from here to both Keswick (a circular route - The Honister Rambler - via either Whinlatter as the 77a, or via Buttermere as the 77) and Cockermouth. These services run about four times daily. The times will vary depending on the time of year, so if you intend to use them, it's best to confirm times and stopping places with the shop just before you go.